Chocolate Chip Cookie Dough Base, Baked Vanilla Cheesecake, & Dollops of Cookie on top. 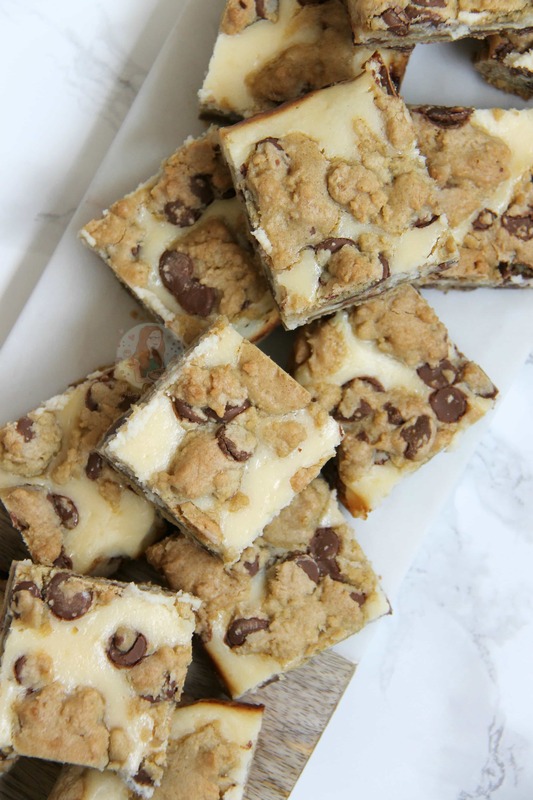 Heavenly delicious traybake combining my two favourite things into Cheesecake Cookie Bars! 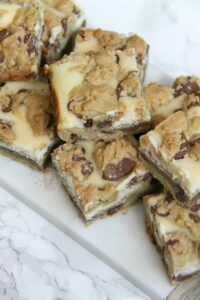 I’ve been trawling the internet for different ways I could develop the delicious and heavenly Cookie Bar after my Rolo Cookie Bars and others have been so delicious and addictive. And then I found this from Eating on a Dime. Oh my daaaaays! Cheesecake and Cookie Bar put together?! YES PLEASE. I’ve made my version of Cheesecake Cookie Bars for a while now, and I genuinely didn’t realise that I have never posted them on to here?! I tried them so soon after my Rolo Cookie Bars that I assumed I had! 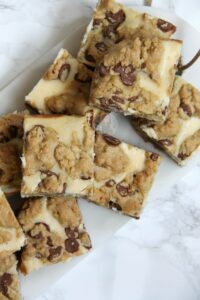 I used the same base recipe as my Rolo Cookie Bars, and then the same Cheesecake mixture from my Cheesecake Brownies and it was perfect. I don’t like to mess with something that I know works, so the cookie base stayed the same, I just switched out the Rolos for just Chocolate Chips. I would say you could use Rolos as well, but it might bake a bit funny with the mixture of Caramel and Cheesecake (I tried, it was delicious, but very gooey.) but honestly? I prefer the Chocolate Chips for this one. This sort of Cheesecake really does have to be baked, as the cookie is obviously baked. However, it’s still so creamy and delicious! I bake the cookie bars for a maximum of 30 minutes, as (if you watch my video you can see) the cheesecake is still ever so slightly wobbly on top, but firm. The cookie isn’t completely solid, and its better that way because it has to be stored in the fridge, the cold will naturally make the cookie firmer. 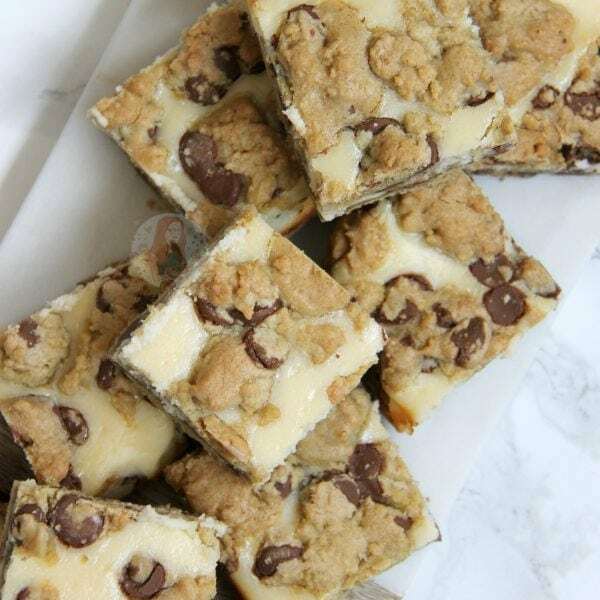 Add in the Dry Ingredients and the Chocolate Chips and mix with a spatula till a thick cookie dough is formed. Press all but a handful of the mixture into the bottom of the tin and press down. In a bowl, beat the cream cheese till loose, and add the sugar and beat again till combined. Gradually beat in the egg till combined along with the vanilla. 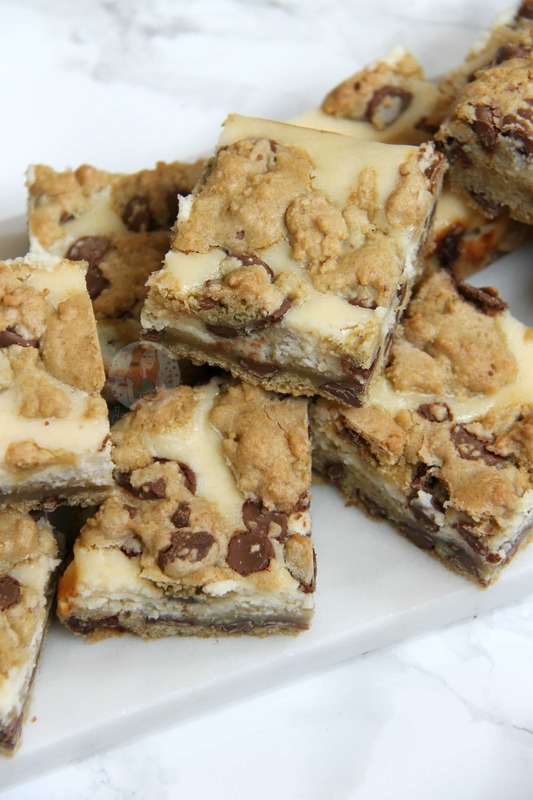 Pour the cheesecake mixture on top of the cookie bars, and then sprinkle over bits of the spare bit of cookie dough. Bake in the oven for 30 minutes! Once baked, leave to cool in the tin completely, and then refrigerate. I used Callebaut Chocolate Chips for my chocolate as I adore the chocolate, but you could use any really. You could even use a chocolate bar which you have chopped into pieces. I also used Philadelphia Cream Cheese, but 250g of a full fat type would be ideal. These delicious beings will last in an airtight container in the fridge for up to 3 days, but they’ll be eaten before then. Sometimes they can still look a little underdone, but often baked cheesecake can do so. It will still have a ever so slight wobble, and when you touch it it will spring back, but it shouldn’t be liquid by any means. 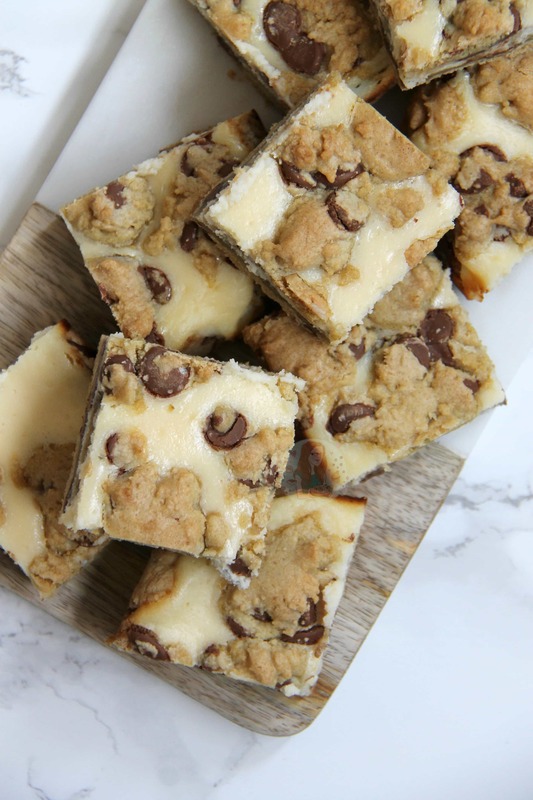 Find my other Cheesecake & Cookie Recipes on my Recipes Page! Older Next post: Twix Cupcakes! Newer Previous post: White Chocolate and Strawberry Tart! Just made these today, along with the chocolate fudge cake (with cream eggs on). Both turned out awesome !! Thanks a lot 😀 Everyone at my work loves your recipes !